The Arizona Diamondbacks visit Coors Field on Thursday, June 22, 2017 to play the Colorado Rockies. The probable starters are Zack Godley for the Diamondbacks and Antonio Senzatela for the Rockies. The opening line for this matchup has Arizona at +135 and Colorado at -145. The Diamondbacks have a 33-35-3 over/under record and a 39-32-0 run line mark. The Rockies are 43-30-0 against the run line and have a 30-38-5 over/under record. The Diamondbacks have a 44-27 overall record this season. Starting pitcher Zack Godley has a 2-1 record with an earned run average of 2.34 and a WHIP of 1.04. He has 44 strikeouts over his 50 innings pitched and he's given up 36 hits. He allows 6.5 hits per 9 innings and he has a FIP of 3.16. The bullpen has an earned run average of 3.36 and they have given up 180 base hits on the year. Teams are hitting .222 against the bullpen and they've struck out 230 hitters and walked 82 batters. As a team, Arizona allows 8 hits per nine innings while striking out 9.4 batters per nine innings. They are 2nd in the league in team earned run average at 3.44. The Diamondbacks pitchers collectively have given up 566 base hits and 243 earned runs. They have allowed 73 home runs this season, ranking them 30th in the league. Arizona as a pitching staff has walked 223 batters and struck out 663. They have walked 3.2 men per 9 innings while striking out 9.4 per 9. They have a team WHIP of 1.24 and their FIP as a unit is 3.64. As a team Arizona is hitting .263, good for 10th in the league. The Diamondbacks hold a .450 team slugging percentage and an on-base percentage of .331, which is good for 11th in baseball. They rank 10th in MLB with 9.0 hits per game. Chris Owings is hitting .293 with an on-base percentage of .326. He has 72 hits this season in 246 at bats with 40 runs batted in. He has a slugging percentage of .463 and an OPS+ of 96. Paul Goldschmidt is hitting .324 this year and he has an on-base percentage of .443. He has totaled 82 hits and he has driven in 58 men in 253 at bats. His OPS+ is 161 while his slugging percentage is at .605. The Diamondbacks have 642 hits, including 134 doubles and 96 home runs. Arizona has walked 236 times so far this season and they have struck out 623 times as a unit. They have left 481 men on base and have a team OPS of .781. They score 5.1 runs per contest and have scored a total of 362 runs this year. Colorado has a 47-26 overall mark this year. With an earned run average of 4.10, Antonio Senzatela has a 9-2 record and a 1.21 WHIP. He has 60 strikeouts over the 83.1 innings he's pitched. He's also given up 77 hits. He allows 8.3 hits per nine innings and his FIP stands at 4.72. The bullpen has an earned run average of 4.22 and they have given up 211 base hits on the year. Teams are hitting .236 against the Rockies bullpen. Their relievers have struck out 238 batters and walked 90 opposing hitters. As a team, Colorado allows 8.4 hits per nine innings while striking out 8 batters per nine innings. They are 10th in the league in team earned run average at 4.11. The Rockies pitchers as a team have surrendered 609 base knocks and 298 earned runs this season. They have given up 86 home runs this year, which ranks 19th in Major League Baseball. Colorado as a staff has walked 242 hitters and struck out 578 batters. They give up a walk 3.3 times per 9 innings while they strike out 8 per 9. Their team WHIP is 1.31 while their FIP as a staff is 4.31. As a team, they are batting .275, good for 3rd in the league. The Rockies hold a .447 team slugging percentage and an on-base percentage of .334, which is good for 8th in baseball. They rank 4th in MLB with 9.4 hits per contest. Charlie Blackmon comes into this matchup batting .327 with an OBP of .376. He has 96 hits this year along with 54 RBI in 294 AB's. He maintains a slugging percentage of .605 with an OPS+ of 136. 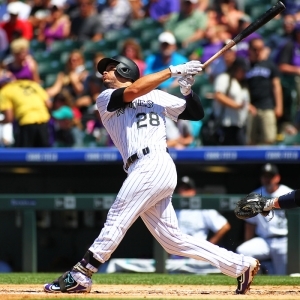 Nolan Arenado is hitting .302 this season and he has an OBP of .354. He has collected 86 hits in 285 at bats while driving in 57 runs. He has an OPS+ of 124 and a slugging percentage of .579. The Rockies as a unit have 689 base hits, including 131 doubles and 88 homers. Colorado has walked 209 times this year and they have struck out on 623 occasions. They have had 465 men left on base and have an OPS of .781. They have scored 5.3 runs per game and totaled 387 runs this season.